Posted on March 14, 2013 | by TRIP! The news has exploded recently about stuff being sold that is supposedly similar to pot. For the sake of this FAQ, we’ll refer to them as ‘Synthetic Smokables’. There is little research on these substances, even by professional drug researchers and lawmakers. As a result, it can be kind of hard to find information about these drugs right now. Whether you want to try them or stay clear, that’s your own decision, but maybe we can help answer some questions you might have about them. Well, at its most basic, these are smokable substances sold in convenience stores and head-shops. Sometimes they are called ‘spices’, but are sold under many other names, too. They are often marketed as being something unlike a drug, such as an “incense” or “potpourri”. Despite these names, they are still sold to smoke. Synthetic Smokables often come in a professional looking package, made of plastic and with a brand name. They usually range in prices from 5-15 dollars, and some places give out samples. Is it a chem or a herb? Most of these drugs are chemicals that are manufactured in a laboratory setting (most likely in Asia), then shipped to Canada and the U.S. Sometimes after this, the chemicals are mixed into a material that looks like dried plant matter so that it is easier to smoke and looks more ‘earthy’. Sometimes they are sold as oils. Other times, they are sold in a powdery form. Regardless, these drugs are manufactured chemicals. How would I do these? So far, the two routes of administration discussed regarding these drugs are in a smokable form, and on rare occasion, in an oral form. It is advisable to consult your source on if it is a smokable or oral version, because smoking the oral form could cause an overdose and doing an oral dose of the smoking form might not affect you. There are a variety of different drugs that go into these smokables, most of them being sold fall under the category of Naphthoylindoles. What the flying f*** is a Naphtho-whatever? You may know some of these chemicals as being under the ‘JWH’ family. Jwh-018 and Jwh-073 are in this family. Beyond that, we don’t really have a ‘street name’ for them yet. 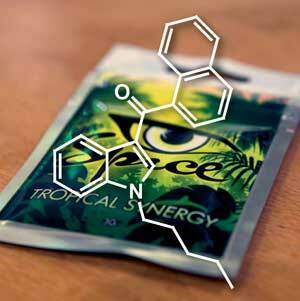 In terms of brain chemicals, they focus on the CB1 and CB2 receptors, which are also used by cannabis. This may explain why many people say the drugs feel similar to pot. Yes and no…These drugs fall into a legal grey area. You are allowed to sell the substance for research purposes if you have the proper paperwork. For human consumption, things start to get a little sketchy. The wholesale suppliers are likely getting them 100% legally, while the people who are selling them as smokable products are probably working on loopholes. However, any substance that is supposedly “like cannabis” is supposed to be illegal for sale. As for personal possession, we can’t say for certain if any charges could be laid – but it is important to note that most of these are still above the counter substances – even if they are only quasi-legal. Are they going to be illegal? There seems to be a game of cat and mouse going on between lawmakers and chemists with these substances. Once lawmakers ban a specific set of substances, chemists synthesize a similar set of chemicals that aren’t illegal and start selling them in these synthetic smokables. Chemists usually know more about chemistry than lawmakers, so as a result the chemicals in these drugs shift slightly and the product as a whole stays legal. Another sneaky tactic some synthetic smokable dealers do is to not disclose their active ingredients on the package. It becomes really hard for lawmakers to ban a chemical or to enforce its ban when they don’t even know what it is. Aren’t they legally obliged to say what is in their drugs? Since a lot of these products state on the packaging “Not for human consumption”, they get away with it. Unfortunately for the user, this often means you can’t be entirely sure what is in them. The United States also seems to be playing a game of cat and mouse with chemists, but the lawmakers over there seem to be a couple steps ahead of the ones in Canada. The best advice we can give is to not bring synthetic smokables over the border! For those wishing to use in America, there are likely to be some available in the States, but they are also likely to be different from the ones available here in Canada. The same goes vice-versa: don’t bring American Synthetic Smokables into Canada. So are these Synthetic Smokables bad for you? There is still a lot of research going into these substances, so we can’t say for certain how neurotoxic they are. There has been one overdose resulting in death confirmed on JWH-018, and there have been reports of non-fatal overdoses occurring on Synthetic Smokables confirmed as well. It’s important to note that this ISN’T pot though. Since these chemicals haven’t been as thoroughly researched we don’t know what kind of brain or organ damage could possibly result from regular use. We strongly recommend not trying the “smoke err’y day” route that many pot smokers choose to do with Synthetic Smokables. Play it safe and don’t go too hard. Multiple trip reports have stated that regular use results in a decreased appetite, with multiple daily uses resulting in eating as little as one or no meals a day. If you intend to or are using this frequently, make sure you are eating well! We also don’t have too much knowledge on the addictive potential of these drugs. Just like all other drugs, however, it is important to be aware of how much, and how often, you are using. Can I take this stuff with any other drugs? We have very little knowledge of mixing Synthetic Smokables with other substances. At the moment, our advice is to remember that this isn’t pot and even though it works on similar receptors in the brain, mixing it with other drugs can result in drastically different, and potentially dangerous, effects when compared to mixing pot with other drugs. Stay Safe! Though we highly recommend not mixing Synthetic Smokables, we will suggest that if you do to at least use low dosages of both substances in order to avoid more dangerous situations that can result from a bad drug combination. I have a question related to Synthetic Smokables that isn’t covered on this FAQ. I have information about Synthetic Smokables that I feel is important to share with you. We’d love any additional information you have on this topic!